Stay ahead of the dust, pollen, and dirt of the spring with these six dust control products by Lord Baltimore for your business. In addition to uniform rentals, Lord Baltimore also provides dust control products that can effortlessly ensure the cleanliness of your business to keep your space looking great throughout the year. These products are especially great for trapping dirt and allergens in your restaurant or storefront so they can be easily cleaned and managed for clients during the day. Stay ahead of the dust, pollen, and dirt of the spring with these six dust control products by Lord Baltimore for your business. These mats are perfect for keeping outdoor dirt outside as customers walk into your business. Especially on rainy days during the spring when mud may be trapped in people’s shoes, the ribs in the mat catch and trap dirt to prevent the interior of your store or restaurant from becoming messy throughout the day. Get a great shine back in your storefront with a light control dust mop for your business. These mops are excellent for shining your tile or wood floors while removing bothersome dust throughout the year. Particularly in the spring, these mops are perfect for removing dust and pollen from your store, which is especially useful for reducing allergy symptoms this season. Walk off mats are the first line of defense for keeping your business dust and dirt free by trapping dirt at your entrance. Available in a variety of sizes and colors, these mats are a must-have for keeping your business clean in the spring. Unlike dust mops, wet mops are ready to take on heavy duty cleaning with water and cleaning solution on your floors. These mops are available to rent, and come with a cotton turbo mop head for maximum cleaning. An anti-fatigue mat is the perfect interior accessory for your team. 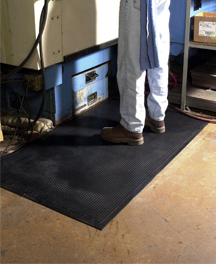 These mats provide relief to employees who are required to stand in one place for a prolonged period of time. The cushion in these mats make them an especially comfortable addition to the standing room behind a cash register or kitchen line. Similar to walk off mats, custom logo mats are a great way to keep your store or restaurant clean with an added bonus of your logo or company name to customize them. In addition to being particularly useful for keeping your store free of dirt and dust, they are durable and easy to clean for long-term use in your business. Your customers will immediately recognize your logo and custom mat color upon entering your store, making your storefront look clean, polished, and ready for business this spring. To learn more about how dust control services can keep your business clean and looking great, please contact Joe Bateman at Lord Baltimore by calling 800-292-1224 or visit LordBaltimoreUniform.com. We also handle towel rental for gyms and salons, as well as apron, towel, uniform and mat rental and purchase for restaurants. Additionally, we also sell and rent uniforms, shop towels, fender covers and mats for manufacturing and automotive industries. This entry was posted on Thursday, March 22nd, 2018	at 4:10 pm	. You can follow any responses to this entry through the RSS 2.0	feed. Both comments and pings are currently closed.